The month of May marked the two first bioBreakfast meetings at UNIS. The project is student-led and initiated by bioCEED student representatives Malene Vinnes and Mari Engelstad. 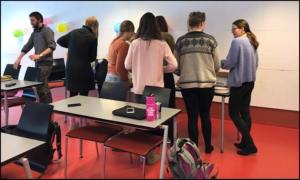 The project sets out to bridge the gap between Bachelor-, master- and Ph.D.-students at the biology department at the university center in Svalbard by arranging breakfast meetings where undergrad students can come and get valuable advice and inspiration. The first two seminars were led by Ph.D. student Maja Hatlebakk and master student Vanessa Pitusi, who both talked about their current projects, as well gave tips on how to get the project you want, how to make valuable contacts and how they ended up picking their thesis. The seminars have been very successful, with the bachelor students getting to ask questions for a while after the initial presentation. The seminars have also sparked a lot of talks among the students regarding what their future may look like. ← The new SFU magazine is out!